What is LTE and what will it bring to Ireland? 4G LTE is slowly seeping into the Irish consciousness. Eircom’s launch announcement seems to have gained most of the attention, although Vodafone and O2 have been rolling out LTE in Ireland too. LTE is a complex set of evolving standards, but suffice it to say that it makes mobile data speeds a whole lot faster, and should provide a more reliable and consistent mobile data experience, too. Testers in the UK are reporting download speeds from 8Mb/s to 25Mb/s, and healthy upload speeds. It (obviously) requires a LTE-compatible handset, like the Samsung S4, and it will usually require a specific 4G subscription – at least initially. LTE data also exhibits less latency, so the customer experience of some real-time data services will improve. Voice can be carried as packet data over LTE, which presents some opportunities (and headaches) for telcos. It seems that initially at least, voice calls will be carried by 3G and 2G networks. Some readers will remember that 3G used to have the alternative name UMTS, which stood for universal mobile telecommunications system – which it wasn’t. While the Japanese & Europeans agreed a 3G standard – in itself a step forward- the Americans largely went with a different version of 3G, a problem that bedevilled the Vodafone-Verizon relationship. LTE should end that problem too. However, one issue with LTE is that it uses a wide range of different frequencies in different countries, resulting in some early compatibility issues. It seems that handset manufacturers are addressing this by increasing the number of radio frequencies supported. Another is that running 4G is reported to reduce battery life. Finally, don’t confuse LTE with 4G, which (outside the technical standards organisations) can refer to LTE, to 3G HSPA or to WiMax. And what is LTE for? Personal services will be enhanced with contextual information so that technology becomes more and more deeply embedded into our daily activities. Enterprise efficiency applications will continue to grow, with big data techniques extracting insight from unstructured data, and digital business changing the way many companies serve customers. New mobile data services for the emergency services – essentially an upgrade path from the TETRA networks that the UK emergency services have been running. Data speeds on TETRA are pretty poor. Perhaps Irish government TETRA users will migrate to LTE when networks are built out. New mobile broadbast services. 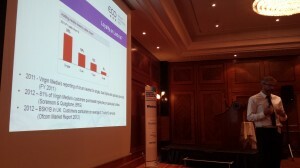 LTE defines a mobile broadcasting service – eMBMS. The report is sceptical about the consumer demand for such services in the UK. Ireland has fewer terrestrial TV channels than the UK, which might increase the chances of a new broadbast technology, however many countries are seeing a decline in broadcast TV viewing, particularly among the young as TV streaming services and the regular internet prove increasingly attractive. So – when LTE appears in your area, it won’t necessarily usher in any fantastic new services – but it should improve the mobile data user experience considerably. This entry was posted in Mobile telecoms and tagged 4G, LTE, TETRA, UMTS on January 12, 2014 by Simon Rees. 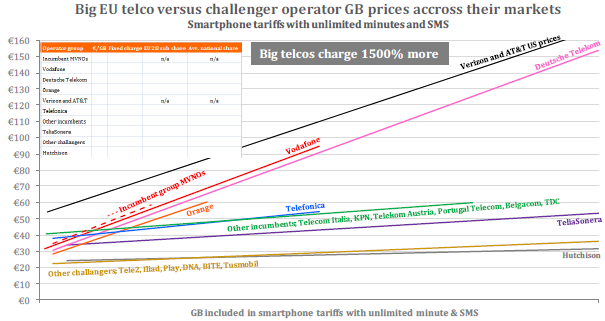 Telecoms is still getting cheaper – see chart 1.4.1. This is probably driven by quad-play, in part, but we await the next quarterly report to see whether prices continue to decline with the consolidation in the mobile industry. This tallies with Figure 4.5.1 which shows that mobile ARPU continues to fall. Eircom’s loss of fixed line market share continues, albeit at a reduced rate. It is too early to say whether Eircom TV is starting to arrest the decline. 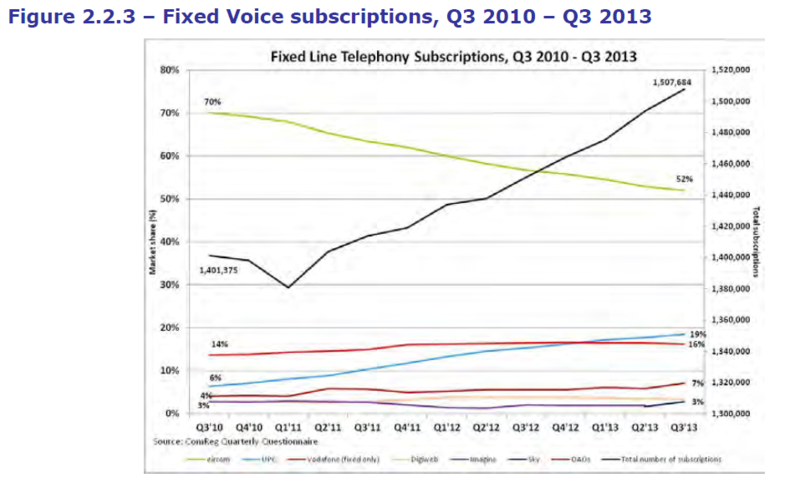 Certainly, as chart 2.2.3 below shows, most of the growth in fixed-lines seems to be coming from UPC. This is backed up by the growth in triple-play services shown in graph 2.2.4. Apologies for the poor quality graphic – the original (here) is a little more legible, though still hard to read. Chart 3.1.2 shows that fixed broadband is substituting for mobile broadband. Overall growth in broadband penetration seems to have plateaued – surely have we not reached saturation? Chart 3.3.1 shows that Ireland is well below the European average on broadband penetration, and the days are gone when one could argue that household size was a significant factor there. This is a real issue – how can Ireland become a knowledge economy if we don’t get the people using computers? Some of the research findings suggest that home broadband in Ireland is expensive (fig 3.5.1), whereas other charts suggest that price is not the main issue. However, according to research published elsewhere, our broadband is also too slow. Research published here shows that Irish broadband upload and download broadband speeds are towards to bottom of the list of European countries. 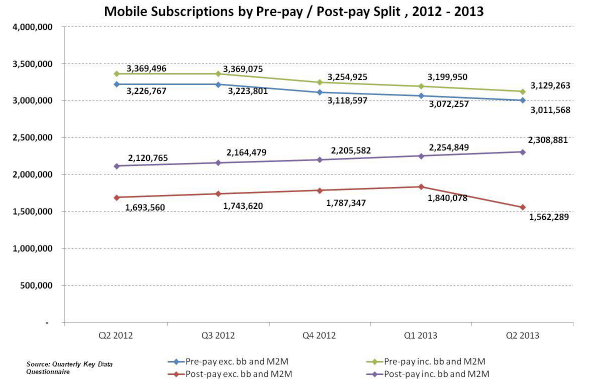 For the first time in a long time, the proportion of postpaid (vs. prepaid) subscriptions fell, albeit slightly – as evidenced in fig 4.2.1. Are consumers or operators pulling back from great deals on postpaid smartphones at the bottom of the market? Chart 4.3.1 below tells an interesting story. It will come to no surprise to telecoms heads that SMS volumes are falling through the floor as Over-The-Air (OTA) services grow. Whatsapp has over 400 Million users! 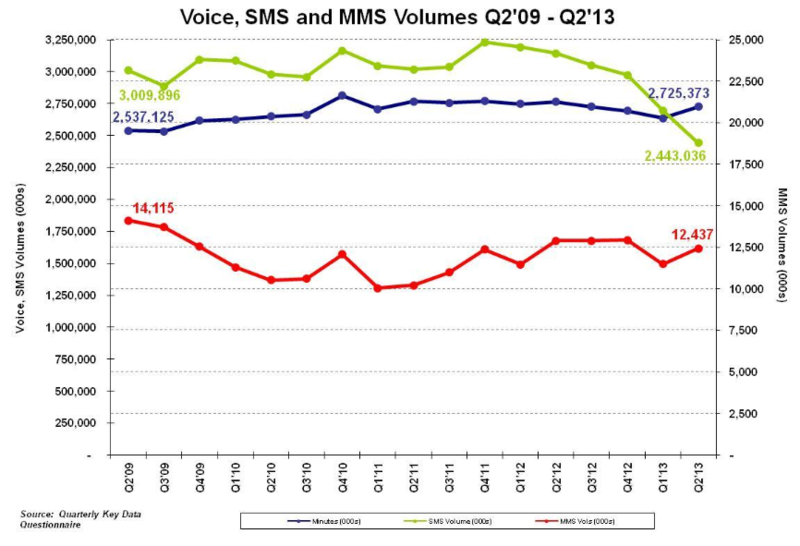 Of course, mobile data volumes are growing fast – they almost doubled in the last 2 years, as the chart shows. Chart 4.3.5, when taken with 4.3.1 above, shows that the growth in mobile data volumes comes from both the number of users and the volume per user. No surprise there. Comreg are doing a good job of keeping us abreast of the new field of machine-to-machine (M2M) communications. 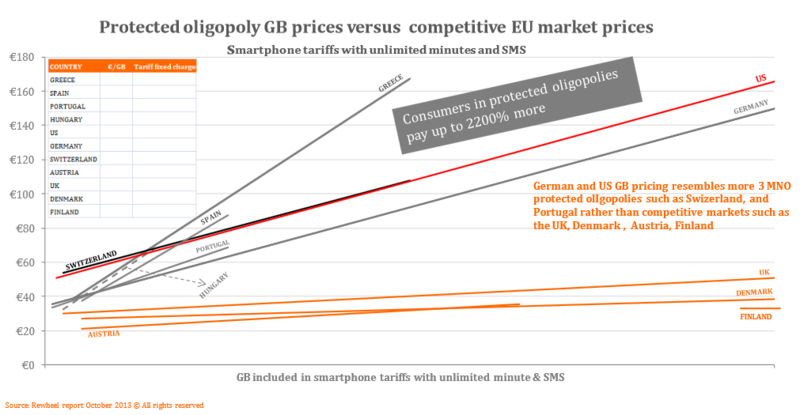 Figure 4.6.1 shows that Vodafone and O2 have most of the market between them. Fig 4.3.2 shows the breakdown of mobile outgoing calls. Another first for Q3 2013 – the volume of mobile international and roaming calls outstrips that of mobile to fixed numbers for first time. So punters are taking fixed lines (2.2.3, above) but they’re probably not giving the numbers out, and if they are, their friends are electing to call them on the mobile. 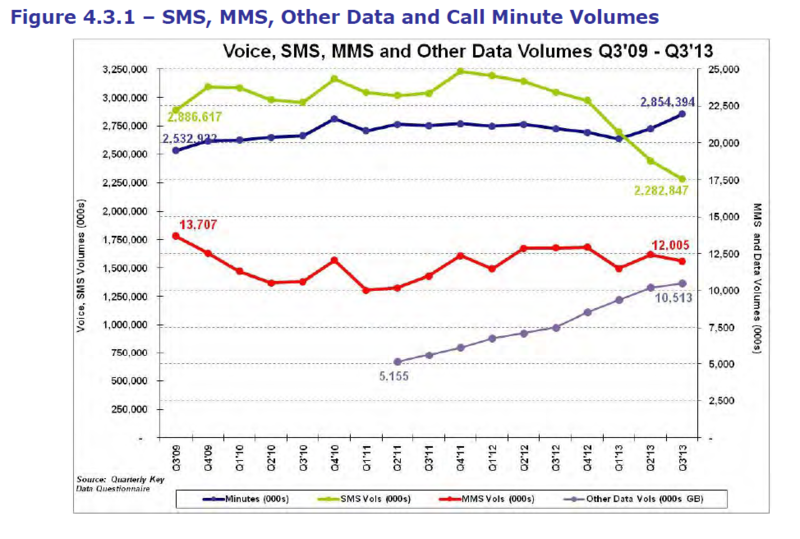 Figure 4.3.4 shows that about ⅔ of mobile voice minutes are on-net. Research has shown that people tend to choose the same network as their social group – this phenomenon is much more marked in countries (e.g. 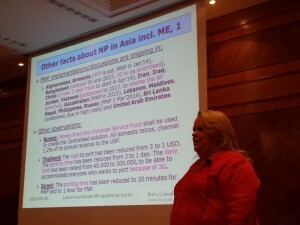 Portugal) where the price advantage for calling on-net is stronger. Overall, another interesting report and a couple of firsts for this quarter. One request to COMREG, please: can you publish the report as a higher-resolution pdf please? 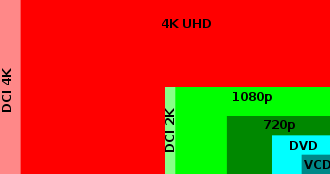 Some graphics (e.g. 2.2.3) are difficult to read. This entry was posted in Broadband, Fixed-line PSTN telecoms, Mobile telecoms on December 31, 2013 by Simon Rees. So, Eircom have announced their eVision TV service. Initial reports are that the user interface on the eVision set-top box is rather good, and the channel lineup – while not suiting everyone – is a decent basic service. Pricing is aggressive. It runs exclusively on their eFibre network, so bandwidth should not be a problem. And why are Eircom getting into the TV business? Well, telecoms and broadcasting have been converging for some time now. The Irish telecoms regulator also regulates broadcasting transmission networks (as does its UK counterpart, OFCOM). Some telcos (e.g. Virgin Media in the UK) have offered TV for many years. However, there is a strong trend today towards converged services (which is basically selling a range of similar services to the customer). The holy grail is quad-play: combining mobile phone service, fixed telephone, broadband access and TV services. In Ireland, UPC have offered a triple-play service (fixed line, broadband and TV) for years and Sky have recently brought broadband and landline service to the Irish market for their own triple-play service. Converged services offer a number of benefits for the telco. First, the opportunity for growth. Most OECD mobile markets are saturated and fixed line penetration has been falling for years. By adding an extra service, the telco can grow revenues. More importantly, the more services a customer takes from a single provider, they less likely they are to churn (i.e. switch providers). 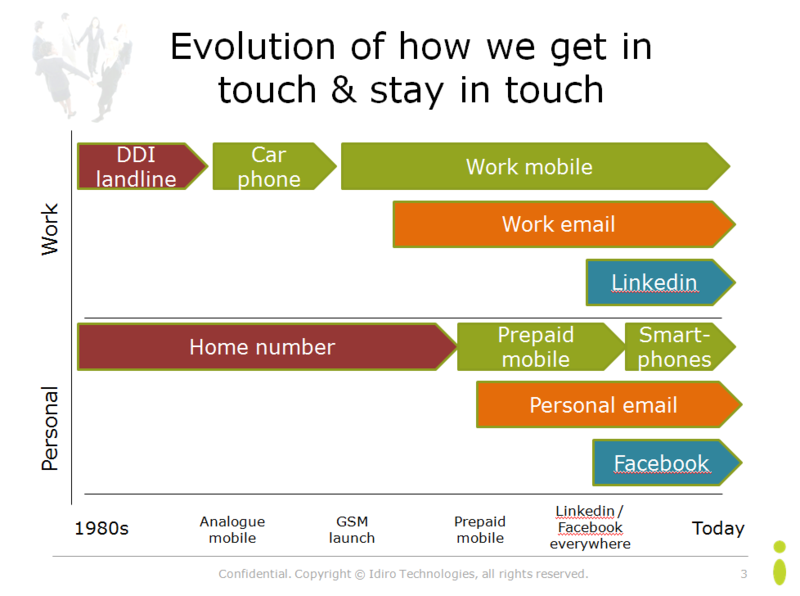 Telcos refer to this as ‘increasing stickiness’. In the UK, BT (who we might mistakenly think of as similar to Eircom) have offered a TV service for some years and in 2012 succeeded in buying the rights to a number of English Premier League matches. BT offer mobile service to businesses as a virtual operator on the Vodafone network and last week announced the replacement of that deal with a new partnership with EE, the new company formed from Orange and T-Mobile in the UK. Will BT move to offering consumer quad-play services? So will Eircom succeed? Suddenly, TV has become a highly competitive market. The chart shows that the 71% of households receive TV from one of the main market cable & satellite provides (UPC, Sky, plus a few others). 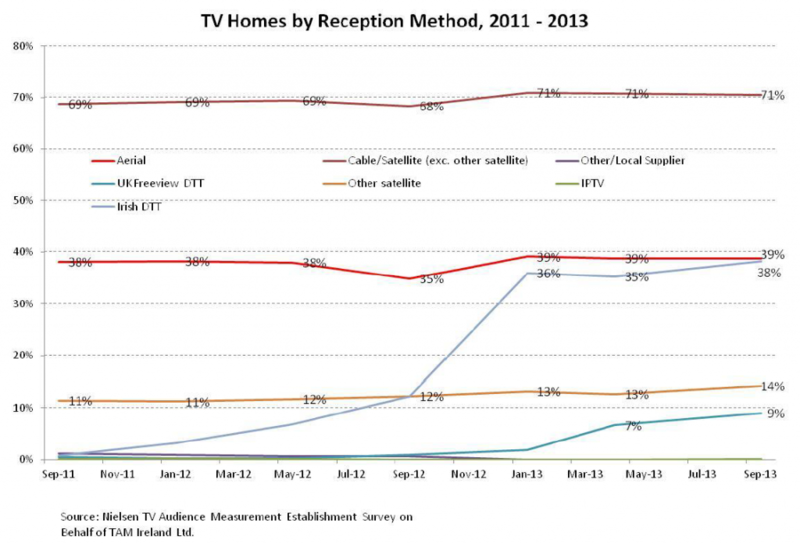 The report from which it was taken also states that only about 10% of houses receive only terrestrial Irish TV – all the rest have some form of cable, satellite or foreign terrestrial (Freeview or Freesat) service. Moreover, TV is changing fast. Advertising revenues, the lifeblood of a TV channel, are falling fast as advertisers switch to new media. Sky have a crucial grip on sports programming. It’s also worth pointing out that whereas telecoms is highly regulated and Eircom are bound to allow wholesale access to their eFibre network, TV content is hardly regulated at all. Eircom has a huge challenge – to take large numbers of customers away from 2 providers, Sky and UPC, who have strong brands, powerful marketing and a reputation for quality. To do this they will need a strong channel lineup and a fully-featured set-top box that is easy to use (note the negative reviews of BT TV here) as well as powerful marketing. Sky have set the bar high in Ireland with quality programming, exclusive sports and great usability, and UPC have the advantage of a fast broadband network – and have already announced a new basic package to compete with eVision. On the other hand, Eircom have a massive database of most of the landlines in the country. Their eFibre infrastructure reaches half a million homes at the moment and will reach many more in a year – and their brand – if not ideally positioned for TV – has has almost universal recognition. Time will tell whether the eVision brand has the muscle and the proposition has the ruthless focus on programming and service quality to take a decent share of the Irish TV market at decent margins. One thing is for sure – this is good news for the TV consumers of Ireland. This entry was posted in Eircom, TV on October 17, 2013 by Simon Rees. Affordable broadband connectivity, services and applications are essential to modern society, offering widely recognized social and economic benefits. It sets out the state of broadband across the world. It iterates the benefits of broadband to human development and specifically to the UN’s Millennium Goals. It describes how governments are being pushed to commit to broadband development plans. Finally, it tackles questions around how to make broadband available to all. A useful document – not least for reminding us in Ireland of how lucky we are to live in the first world. This entry was posted in Broadband on September 24, 2013 by Simon Rees.